The hangover—more than a humorous film or a delayed start after a great night out—is a serious condition that can be very painful, resulting in a breakfast of Alka-Seltzer, hours spent sipping from a bottle of Pedialyte and perhaps even a day spent at home “sick.” I cannot count, nor can I even begin to remember the number of hangovers I’ve had in the near-twenty years of imbibing I’ve enjoyed as an adult—most of which I’ve hazarded as a bar owner. There’s just too much delicious temptation in all those bottles with their beautiful labels and exotic origins! Like many others, I’ve heaped morning-after pain upon myself from nights out in Las Vegas, New Orleans, New York, Los Angeles and plenty more locales known for their nightlife. I’ve experienced the shakes at 30,000 feet; I’ve been bedridden for days from too much hooch. On the subject of hangovers, I am an unfortunate authority. However, of the hundreds of days I’ve spent visiting wineries, breweries and distilleries on four continents, rarely has the hangover struck when drinking at the source. Why is that? Could the spirit be purer when nipped at its origins? Some certainly think so. Others say that line of thinking involves more myth and marketing than science. So how does it seem to hold true? I argue that the more cognizant we are of our drinking, the more likely we are to take measures to counteract the harmful effects of alcohol. For example: a winery tour is most often a planned occasion, complete with a picnic or a catered meal and plenty of water. The classic symptoms of a hangover—that headache, the dry skin, the wobbly, cold-sweat-inducing nausea—are the result of three things: dehydration, sugar and the quantity of booze consumed. Heed this bartender’s simple advice to lessen the effects of your next hangover: grab a bite before or while drinking, and do the same for consuming water. For a head start, drink a big glass of water before the first cocktail arrives. Then, always know what’s in your glass, and set a limit for yourself before that first drink arrives, before your judgment becomes (even a little bit) impaired. Our livers love consistency. Drink three glasses of red wine every day and your liver will metabolize red wine very easily. The same holds true for the person who enjoys going out a few nights a week and sampling different cocktails: our individual patterns teach our bodies what we can handle. This, folks, is what we call building a tolerance. Too much sugar will result in a hangover. How much is too much? The answer is different for every person. Every alcoholic beverage metabolizes in our bodies as sugar; therefore, look for drinks that are made without much added sugar. Commercial sweet-and-sour mixes may contain corn syrup, and plenty of wines (including most sparkling wines) are produced these days by adding sugar during fermentation to punch up the flavors of the grape as well as the alcohol level. Beware: often what we enjoy drinking isn’t the best for our bodies. Trust me. Be smart and seek out the best restaurants and bartenders whose deft touch you trust. In life, you get what you pay for. As a culinary professional, I often call a restaurant ahead of time to inquire not only who will be tending bar that eve, but also who’ll be cooking in the kitchen. A great chef de cuisine makes all the difference—and so does a skilled bartender. Get to know the people who create what you love to eat and drink, and your life will be better. Each person has a unique metabolism and tolerance for different types of alcohol. A serious juniper allergy means gin is forbidden. You may be able to metabolize grape-based products such as a glass of rioja or a pisco punch with ease, but grain-based alcohol such as beer and whiskey may make everything funny for your tummy. It?s usually when I?ve strayed from what my body metabolizes easily, neglected to eat anything at all and swilled only whatever cocktail someone put in my hand, that the next morning Mr. Hangover, like an angry landlord, knocked heavily on my head. When it comes to an evening of imbibing, stick with what you know if you want to steer clear of a hangover. William Faulkner once quipped, “Civilization begins with distillation.” But civilization actually began long before the discovery of distillation in the 9th century, if only a few thousand years before that, with the advent of intentional fermentation; that’s when we humans began celebrating occasions with beer and wine. Exploring drink with intention is a worthy exercise and a delicious cultural exchange, without which life would be rather boring. Let’s not let that happen. Editor’s Note: What do you do to curb a hangover? Share your wisdom in the comments! Duggan McDonnell owns and operates Cantina, the San Fran-centric cocktail lounge dedicated to Latin spirits and California cocktails. He operates Liquid Think Tank, a beverage consultancy, and co-founded San Francisco Cocktail Week and the Barbary Coast Conservancy of the American Cocktail. He also co-founded and serves as CEO and Master Blender of Campo de Encanto pisco, winner of the Ministry of Production’s Gran Medalla de Oro Best in Show gold medal (the highest honor for any pisco). 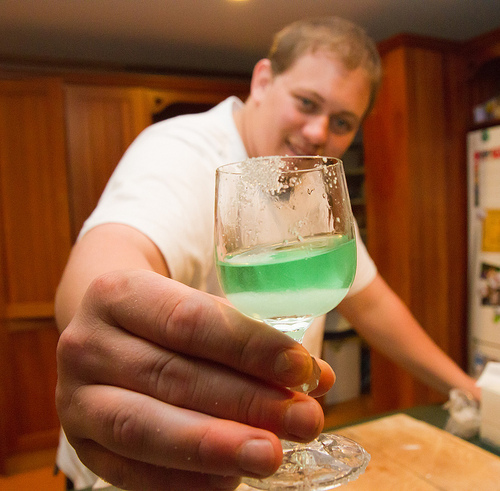 Duggan’s many accolades include a Best Mixologist of the Year nomination at Tales of the Cocktail (twice) in New Orleans, and Leader of the American Cocktail Revolution from Food & Wine. A featured expert on the TV show “Great Cocktails,” Duggan also served as the spokesperson for the got milk? 2010 holiday cocktail TV campaign. He’s designed cocktails for the Sundance Film Festival and Aspen Food & Wine, and has consulted for spirits companies including Tequila Don Julio, Grey Goose Vodka and Cabana Cachaca. "was just going by what..."
"Just to clarify, I tip..."
"and I dont think that..."
"youre not going to buy..."
"That’s why take out is..."